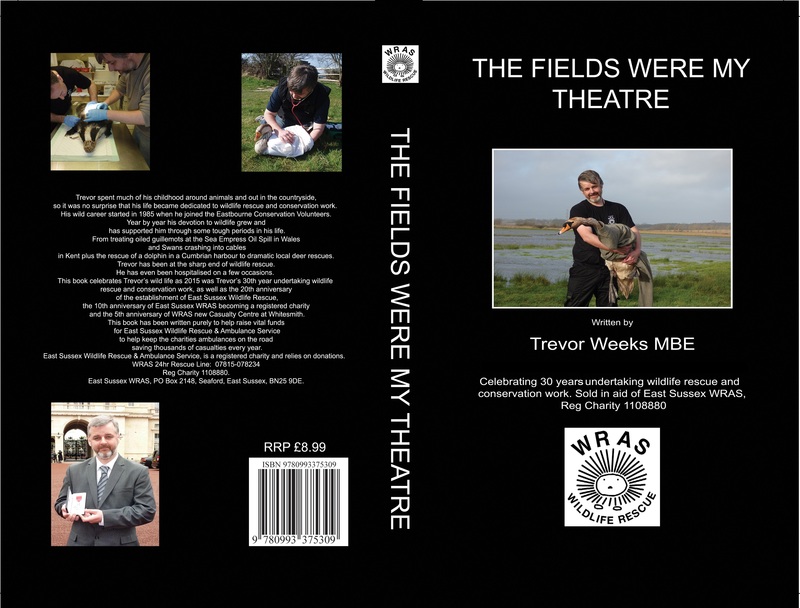 "The Fields Were My Theatre" By Trevor Weeks MBE. ISBN: 978-0-9933753-0-9 Launch Date: 29th August 2015. Trevor spent much of his childhood around animals and out in the countryside, so it was no surprise that his life became dedicated to wildlife rescue and conservation work. His wild career started in 1985 when he joined the Eastbourne Conservation Volunteers. Year by year his devotion to wildlife grew and has supported him through some tough periods in his life. From treating oiled guillemots at the Sea Empress Oil Spill in Wales and Swan crashing into cables in Kent plus the rescue of a dolphin in a Cumbrian harbour to dramatic local deer rescues, Trevor has been at the sharp end of wildlife rescue. He has even been hospitalised on a few occasions. This book celebrates Trevor’s wild life as 2015 was Trevor’s 30th year undertaking wildlife rescue and conservation work, as well as the 20th anniversary of the establishment of East Sussex Wildlife Rescue, the 10th anniversary of East Sussex WRAS becoming a registered charity and the 5th anniversary of WRAS new Casualty Centre at Whitesmith. This book has been written purely to help raise vital funds for East Sussex Wildlife Rescue & Ambulance Service to help keep the charities ambulances on the road saving thousands of casualties every year. The book is 240 pages and includes 32 colour pages of photos. Reccommended Retail price £8.99. We are offering them for sale at £8.99 with free UK postage. Please allow 7 days for processing and delivery. Books can be puchased from our Casualty Centre, Unit 2 The Shaw Barn, Whitesmith, BN8 6JD or from Paws n Claws Pet Supplies, Olives Yard, High Street, Uckfield, TN22 1QP for £8.99 too. Some of the names and locations in this book have been changed to avoid embarrassment or to ensure privacy. The views expressed in this book are purely those of the author and not necessarily those of East Sussex WRAS nor any other person involved in the charity, editorial or publishing of this book. © 2015 by the author of this book, Trevor Weeks. The author retains sole copyright to this book.